Sampar Eye Rule ($78 at www.Beauty360.com) The cream comes in a massaging ball applicator. Click it to the right and the solution neatly comes out in a circular formation on the ball. The cream is packed with adenosine and peptides, which hydrates, refreshes, and smoothes the skin. It definitely feels refreshing on and I look forward to using it after a long day out and about. It seems to calm down the aggravated delicate skin and there's no doubt the cream has softened the area. 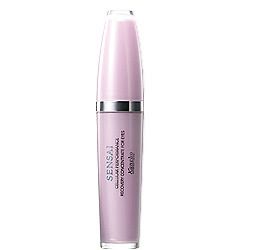 Sensai Recovery Concentrate For Eyes ($180 at bergdorfgoodman.com) This luxe serum is thick, creamy, and extremely moisturizing. It helps boost cellular enery metabolism and minimizes the appearance of wrinkles and dark circles. My skin definitely looks radiant after using it and it's very gentle on the skin. I kinda wanted to lather it all over my face. 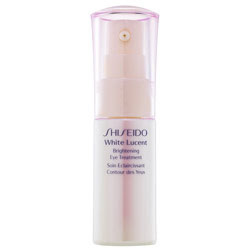 Shiseido White Lucent Brightening Eye Treatment ($52 at us.shiseido.com & sephora.com) This award-winning cream addresses both melanin formation and poor local microcirculation. Two major causes of dark circles. The treatment brings a brightness to the eye area and diminishes the appearance of melanin pigments. I've been using this for a few weeks and while I haven't seen any radical changes yet, I still really like how it feels on the skin. It's also made the skin under my eyes feel incredibly soft. Not sure about the dark circles yet but am still holding out hope! B.Kamins Bio Maple Eye Cream ($60 at b.kamins.com) I love this skincare line. The cream is meant for dry skin (like mine) and its glossy finish soothes the skin and relaxes the eye area. It's formulated with Episphere-Blue™ technology, which is made of heat-activated, time-released tiny blue capsules of anti-oxidant vitamin E to help moisturize and repair the skin. I'll be adding to this list as I continue to try eye creams, so keep looking out for my reviews. I will not stop till I find the perfect eye cream!! Check out some of my other under-eye tips and the benefits of using primer with your under-eye concealer.